How Many Layers of Dip Did You Eat During the Super Bowl? This was a deja vu Super Bowl for me. 17 years ago I was studying abroad in Japan when the St. Louis Rams–a team I started rooting for when I entered my freshman year at Washington University in St. Louis in 1999, the same year that Kurt Warner led the Rams to a Super Bowl victory–were playing in the big game against the Patriots. Amazingly, Tom Brady–the current quarterback of the Patriots–was early in his career with New England back then, and he led the Patriots to a victory over Warner’s Rams. As much as I root against New England, I have to admire his legacy and longevity. Anyway, for today’s game, I set out to make an 8-layer dip. 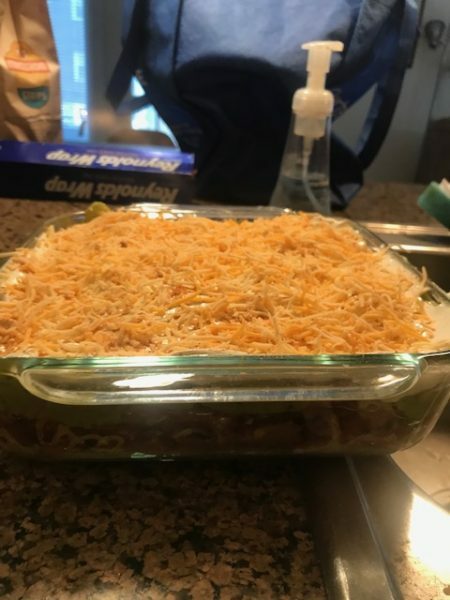 No, not a standard 7-layer dip. They said it couldn’t be done, but I wanted to jam an extra layer in there to see what would happen. I started by warming up layers of refried beans and taco cheese in the oven. I was so young and naive then. When I pulled it out of the oven, I realized that none of the other layers want to be warm. Actually, now that I ran the numbers, it does appear that I only made a 7-layer dip. They said it couldn’t be done, and apparently they were right! Some people might taint their dip with a layer of olives, but I have a no-olives rule in my house. Did you enjoy any delicious dips today? Which layers do you prefer in an X-layer dip? This entry was posted on Sunday, February 3rd, 2019 at 9:58 pm	and is filed under food, sports. You can follow any responses to this entry through the RSS 2.0 feed. I’m with you on the no olives part. They will ruin a dip in a hurry. Also I’d add diced tomatoes or salsa to your list. Do you still support the Rams? I stopped when they left. Thanks Nick! The pico de gallo kind of covered both the tomato and salsa categories, but I’m always happy to add more salsa. Like you, I stopped rooting for the Rams when they left St. Louis. I don’t wish them ill, and I would rather they win than the Patriots. I think the ideal score for the game would have been a 2-0 victory for the Rams (a single safety by Donald), which would have been sufficiently embarrassing for both teams.